Forget Mars' early climate change, losing its magnetic field and most of its atmosphere or Earth's abrupt warming and ice age cycles. Astronomers have discovered evidence of an intense warming period in the early history of the universe, described as a form of "cosmic climate change." The findings were made by researchers measuring the temperature of gas that lies in between galaxies, whonfound a clear indication that the temperature of this 'intergalactic medium' had increased steadily between the period when the Universe was one tenth of its current age and the point at which it reached one quarter of its current age. The team believe that the effect was caused by quasars; giant accreting black holes at the heart of galaxies. The quasars emitted ultraviolet light and triggered a series of reactions in the gas clouds that caused the temperature to rise. University of Cambridge astronomer Dr. George Becker, who led the study, said: "Early in the history of the universe, the vast majority of matter was not in stars or galaxies. Instead, it was spread out in a very thin gas that filled up all of space." "The gas casts a series of shadows on the light given off by quasars, which are extremely distant, bright objects. By analysing how those shadows block the background light from the quasars, we can infer many of the properties of the absorbing gas, such as where it is, what it's made of, and how hot it is." The quasar light the astronomers looked at was more than 10 billion years old by the time it reached Earth and had travelled through vast tracts of the Universe. As a result, each intergalactic cloud the light passed through during this period left an imprint. The cumulative effect can be used as a fossil record of the temperature in the early Universe, just as the Earth's climate might be studied from ice cores and tree rings. The temperatures in question were massive compared with standard Earth temperature. The research suggests that one billion years after the Big Bang, the gas was a "cool" 8,000 degrees Celsius. By three and half billion years, the temperature had climbed to at least 12,000 degrees. This warming trend is believed to run counter to normal cosmic climate patterns, as normally the Universe is expected to cool down over time. As the Universe expands, the gas should get colder, much like gas escaping from an aerosol can. To create the observed rise in temperature, something substantial must have been heating the gas. The astronomers believe that the climate change was caused by the huge amount of energy coming from young, active galaxies during this epoch. Dr. Martin Haehnelt, from the University of Cambridge's Kavli Institute for Cosmology, who also took part in the research, said: "The likely culprits are the quasars themselves. Over the period of cosmic history we studied, quasars were becoming much more common. 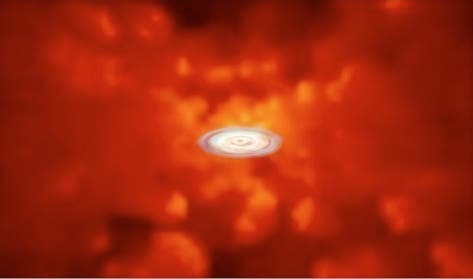 These objects, which are thought to be giant black holes swallowing up material in the centres of galaxies, emit huge amounts of energetic ultraviolet light. These UV rays would have interacted with the intergalactic gas, creating the rise in temperature we observed." One of the lightest and most abundant elements in the intergalactic clouds, Helium, would have played a vital role in the heating process, the researchers suggest. Ultraviolet light will strip the electrons from a Helium atom, freeing them to collide with other atoms and heat up the gas. Once the supply of fresh helium was exhausted, the Universe would have started to cool down again. Astronomers believe this probably happened when the universe was about one quarter of its present age. Recent observations with the Hubble Space Telescope also indicate that the interaction between energetic photons and intergalactic helium had mostly completed by this time. The discovery, shortly to be published in the Monthly Notices of the Royal Astronomical Society, was made possible with data taken with the 10-metre Keck telescopes in Hawaii and was aided by advanced simulations run on a supercomputer at the University of Cambridge.